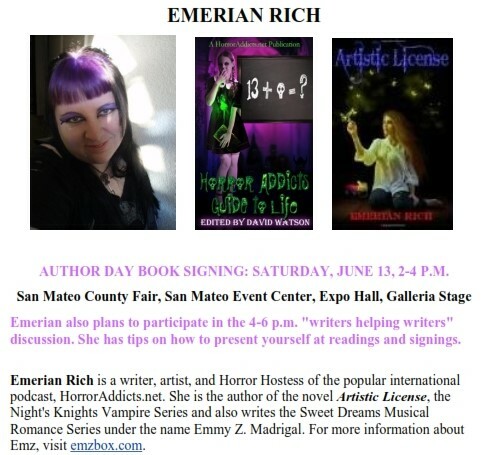 the San Mateo County Fair, Author day! Saturday June 13 from 1-4 P.M.
Over 25 local authors will gather near the Literary Arts Stage in Expo Hall to sell and sign their books on June 13. Here’s a great opportunity to support local authors and your own “reading habit.” Plus you might even find a perfect gift for a friend. They’ll gladly sign your book purchases for you! *** Use author code: SMCF15 tol get 25% off all Emerian Rich purchases. Cash and PayPal/Credit Card accepted. Writers Helping Writers: Authors discuss promotion and other challenges they encounter. Saturday, June 13, 4-6 P.M.
With authors Laurel Anne Hill, Emerian Rich, and more. And if you use author code: SMCF15, you will get 25% off all Emerian Rich purchases. ~ by Sumiko Saulson on June 11, 2015.